Giddy Greetings: 4000 Visitors! Blog Candy Giveaway! Easy...Just Comment For A Chance To Win! 4000 Visitors! Blog Candy Giveaway! Easy...Just Comment For A Chance To Win! Wow! I just wanted to say thanks to everyone who visits my blog. A blog is a bit like a journal so I wanted to give a little something back to you. 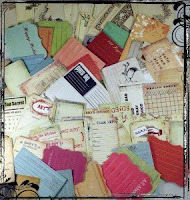 I am giving My Mind's Eye Journaling Card Mega Pack. There are over 100+ pieces in this pack! The picture above is a sample of what you are going to get. Here's all I ask.......since these are journaling cards, leave me a comment and tell me your favorite moment that you are going to write on one of your journal cards. That's it! I will pick a winner on April 8th, so that gives you a week. If you aren't a blogger you can still enter, just leave me your email address so I know how to contact you if you win! I will be using Random.Org to pick the winner. Good luck! hi, i think i'm going to be writing abt my journey fr engagement to e wedding at end of next year. getting into the mood to creating a DIY wedding.. I've been enjoying your posts via google reader. My favourite moment to journal would be my one year wedding anniversary and navigating our road to forever together. What a great giveaway! I have been meaning to do a favorite family recipe journal for each of my kids. I think your journaling cards would be perfect! I´m currently working on my first acrylic album, that I´m going to give to one of my best friends on her hen night. It is celebrating 12 years of friendship! I would use the journaling cards in the album. After 12 years, we hundreds of memories worth writing down! Congrats on your 4000 visitors, thats great!!! Awesome prize! I have a photo, on my desk, of my mother-in-law just 4 months before she passed away. Her children made a special meal for her, that she was still actually able to eat. I will be journaling about that. I have a plan to journalise my boyfriend's one year stay in Calcutta(a city in India). His house, friends, places where he has his food etc. It would be anyday better than seeing all those snaps on the computer. I was thinking about journaling about my everyday life as a stay at home mom. I have been struggling at this latley so many writing about it will help. I think I will be journaling about my first i year in the "big" city - Tel Aviv. thank you very much for the chance to win this journaling candy! Journaling - I would like to write the birth story of my 5 children. Congrats on all those visitors!!! Great giveaway and I am enjoying your blog!! I've been wanting to create a journal of all the great blogs I stumble across. There are so many and its hard to remember where you saw a great tutorial, or sample, or found inspiration. Great Giveaway.. thanks for the opportunity. Thanks for the great giveaway! I would journal about my 10-month-old grandson, especially about how his beautiful smile lights up his whole face and makes my heart flutter. What an Awesome set of blog candy!!!! Very sweet of you!! I think I would use one to finish a page that Im working on for my daughters Ballet picture from last year! Yep LAST YEAR!! Yikes that was awhile ago. Anyways I want to frame her page, I wont be putting in a scrapbook :) Thank you for this chance to win some Awesome blog candy!! At the moment I am mainly working on the story of us building my log cabin from scratch. It arrived in November when it was snowing! there are loads of picture and loads of all sorts of weather - so it's great fun! Wow that is a lot of hits! I would love to win this blog candy. I am most likely to write something about my four little angels. They are very busy I am sure I will right about there adventures. I've been thinking of journaling little bits of everyday life with my kids, the little things that might get forgotten but are still so precious.